My Halloween card today uses an image from the Lockhart Stamp Company. 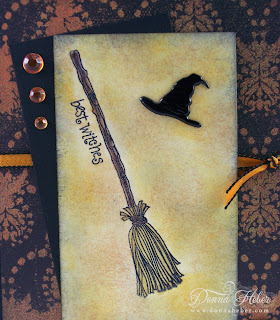 On a piece of Very Vanilla paper the broom was inked with VersaMark then StazOn Black and embossed with clear embossing powder and a heat gun. The handle was colored in Chocolate Chip and the broom in Distressed Scattered Straw. Next, I sponged around the image in Distressed Antique Linen, Wild Honey, Tea Dye, Spiced Marmalade, Brushed Corduroy and Black Soot. 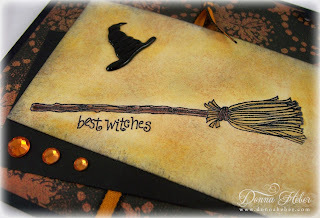 I adhered the focal image to a piece of Basic Black then added a witch hat brad, orange rhinestones and ribbon. These pieces were then mounted to a piece of Memory Box Blackbird Designer Paper. The cat image is from the Spellbinders Halloween Fence Scenes die. I added some green glitter paper for his eyes. This is such an elegant Halloween card ... love it! Your background is breathtaking and the kitty's eyes are the perfect touch! Nothing spookier than green cat eyes!! Card has a wonderful vintage look, haunting. Great card. I really like this Donna, great image! 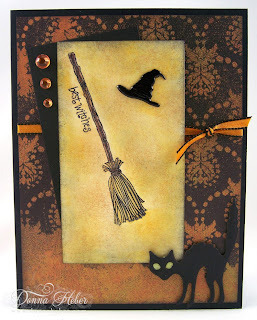 Great card and that sponged background makes it look extra spooky! Wow you did such a great job! Love the green cat eyes!! The sponge accent is perfect- just the right amount! Love your Halloween card. The background paper is so pretty. Goes well with the theme. The stamps are great... Great job on design..
Love the cat at the bottom. I love the one with the cat! Super cool! I love the background paper too! FaBOO!